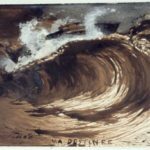 The artwork of Victor Hugo is revealed at the Hammer Museum in Los Angeles. 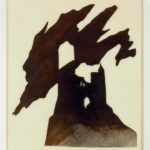 Victor Hugo, Silhouette de château illuminé par un orage (Silhouette of a castle struck by lightning), circa 1854-57, stencil cut from card, with charcoal, brown ink and wash, 18.5 x 16 cm. Victor Hugo, Silhouette de l’Ermitage (Silhouette of l’Ermitage), circa 1855, stencil cut from paper with charcoal, 14.7 x 11.5 cm. Victor Hugo, Taches (Stains), circa 1875, black and gray-blue ink and wash on paper, 44.3 x 55 cm. Victor Hugo, Souvenir d’un burg des Vosges (Souvenir of a castle in the Vosges), 1857, brown ink and wash and white gouache on paper, 47 x 31 cm. Some of the most astonishing and advanced artworks of of the 19th century were created by an amateur, part-time artist—Victor Hugo. Famous in France and throughout Europe for his poetry and epic novels such as Les Misérables and Notre-Dame de Paris (“The Hunchback of Notre Dame”), Hugo was also a passionate practitioner of ink-and-wash drawing, which he pursued privately, with no desire to make a name for himself as a visual artist. (In fact, he was concerned that his drawings might encroach on his literary reputation.) It was not until 1888, three years after his death at the age of 83, that any of his drawings were exhibited in public, although he occasionally allowed prints to be made from a few of them. Delacroix admired his work and claimed that if he had wanted to, Hugo could have been the greatest artist of his age. Baudelaire, a fellow writer who was also deeply attracted to the visual arts (as a critic), wrote of Hugo, “Our poet is the king of landscape painters.” And Théophile Gautier wrote that Hugo “excels at combining, in his somber and fierce fantasies, the effects of the chiaroscuro of Goya and the terrifying architecture of Piranesi.” While Hugo’s drawings are clearly rooted in the aesthetics of the Romantic movement, to our eyes they look remarkably contemporary. With their bold use of form and texture, some of them seem to prefigure 20th-century abstraction, like the late works of Turner. The Hammer Museum at UCLA in Los Angeles is now giving American viewers a rare opportunity to appreciate Hugo’s drawings. “Stones to Stains: The Art of Victor Hugo,” which opened on September 27 and continues through December 30, exhibits more than 75 drawings and photographs spanning the artist’s career, loaned from major European and American collections including those of the Maisons de Victor Hugo, the Bibliothèque Nationale de France, the Musée d’Orsay, the Nationalmuseum in Stockholm, the Art Institute of Chicago, the Metropolitan Museum of Art, and the Morgan Library. Curated by the Hammer’s Cynthia Burlingham and Allegra Pesenti, this exhibition is the first to focus on Hugo’s drawings since a show at the Drawing Center in New York in 1998. It is accompanied by a catalogue with essays by Burlingham, Pesenti, and Swiss independent scholar Florian Rodari and a chronology by Matthieu Vahanian, curatorial assistant at UCLA’s Grunwald Center for the Graphic Arts. Despite the fact that he devoted far more time to writing than drawing, Hugo produced a vast visual oeuvre of over 3,000 sheets. It seems that doing them was therapeutic for him, a retreat into a purely visual, contemplative realm after the effort of writing. Although he drew throughout his life, his greatest volume of production was between 1848 and 1851, when he all but gave up writing in favor of spolitical activity in support of the revolutionary liberal cause of that period. After the failure of this cause and the accession to power of Napoleon III, Hugo was exiled to the Channel Islands of Guernsey and Jersey, where he spent the years 1852–70; this time was also a particularly fertile one for his drawing practice. Hugo was inspired by the rocky landscape of the islands, as he had been earlier by the human-hewn stones of Paris’ architecture. His more realistic drawings include dramatic, moody images of castles, cathedral spires, cityscapes, and the famous Eddystone lighthouse. One drawing from 1866, of a staircase leading up to a barred window inside a Guernsey lighthouse, makes clear why Gautier compared Hugo to Piranesi; the image, though not of a prison, strongly suggests the Carceri of the Italian master. The window glows with the light of freedom yet unattained, and one thinks of the years Jean Valjean spent in jail in Les Misérables. Another consistent theme in Hugo’s drawings is water, which held multiple meanings for him—power, mutability, destiny. It also had a tragic connotation because of his daughter Léopoldine’s accidental death by drowning in the Seine in 1843, at the age of 19. This event forever changed Hugo, and for several years thereafter his depression was so severe that he could barely write. 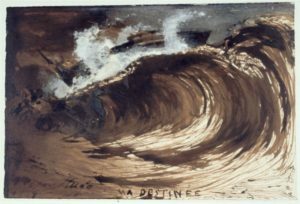 One memorable sheet in the exhibition, made in 1867, shows a huge wave curling, cresting, and foaming, over the inscription “Ma Destinée” (“my destiny”). Water is, of course, also the medium of Hugo’s drawings, in the form of the ink washes, mostly brown, that he employed to make them. In his use of wash, and, in fact, all his techniques, Hugo took the maximum liberty, completely indifferent to academic conventions and public taste alike. 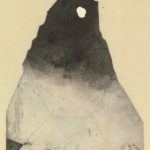 He would let the pooling of the ink-and-water mix on the paper create its own shapes; this process is what led to the seemingly unprecedented abstraction of Hugo’s works on paper. Sometimes he would fold the paper to create a Rohrschach-like blotting effect. These drawings he called his taches (stains). He would add texture with impressions made with his fingertips or with objects such as leaves or bits of lace, and sprinkle graphite powder over the drawing. 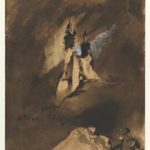 Further departing from traditional methods, he made extensive use of stencils that he cut himself to create irregular forms; one of the most memorable of these depicts a castle on a rocky crag in silhouette, almost dwarfed by jagged shapes overhead that look like black lightning bolts. 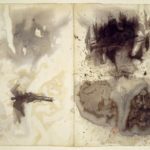 Hugo’s wild, untethered experimentation with techniques and materials, making the fullest use of the medium’s expressive possibilities, marks him as a proto-modernist and proto-abstractionist.